We have big shoes to fill this year. All of the previous hunters before us tagged bucks and all green scored well within P&Y minimums. We'll see if Jake Ensign, Bill Gaunt and I can continue this incredible streak of 100% success on PY bucks! This is also our 10 Year Anniversary here at CRO. How time flies. 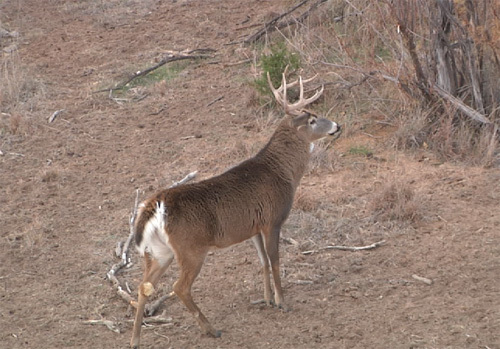 Take a quick peek at our very first Live Hunt here with Kent Jarnagin and Kent Woolfolk! 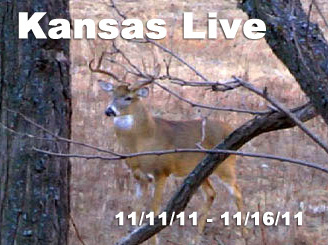 First Live Hunt from Kansas. The weather this morning was clear and cold with barely just a puff of wind. Kent suggested the Junk yard stand and that sounded good to me. This stand holds a special place in my hunting memory, I had killed a giant buck there in 2004. It remains my most impressive buck to date. When Kent drove me to the stand we blew turkeys off the roost. I always have a NR turkey permit on me so if one presents a shot I'm taking it. 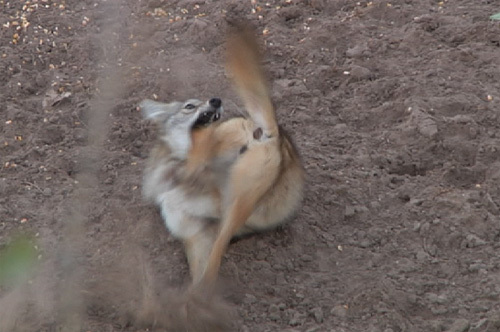 And of course, every coyote I see is in trouble. Kent drove off with Jake and Bill and within minutes deer started to walk by my stand in the dark. I had an hour before pink light so I got to enjoy a rare experience of hearing chasing, fighting, grunting and snort wheezes in total darkness. As the sun neared the horizon I could see a few does feeding around me. Not at the bait, but just on browse in the thickets. 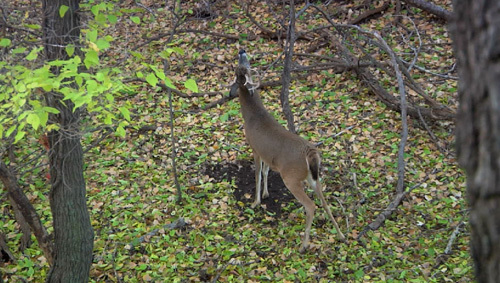 I found this strange but then realized there was a buck at the bait and they wouldn't go anywhere near him. He was pretty small, nothing special. A few minutes later his head snapped and a giant buck was approaching. I say giant body-wise, his rack was kind of strange and not what I wanted. I watched several bucks throughout the morning but nothing worth shooting - especially for day 1. There is a big buck hanging around the stand called the Barbie stand. I headed there for this afternoon. An hour into my sit a truck drove right to the bottom of the stand, a guy in camo looked up and blurted out an expletive. He did a K-turn and raced down the road. I had him on video and called Kent who intercepted him. He claimed to be a government employee working for the EPA. Where he was lost was no-man's land and no reason for an EPA official to be driving around. We're giving him the benefit of the doubt. Another hour later and several bucks came in. A really nice 10 that would score easily (guess mid 140's to 150) came by the stand. But he was just not what I am looking for here. He hung around for quite a while and suddenly ran off. A coyote had snuck in and ran him off. Then he sat under my stand munching bait and that was a really, really bad move for him. Despite being the ideal time of day I just can't pass up a shot at a coyote. I let him have it and he ran into the thickets and fell over. Twenty minutes after my coyote sucked his last breath another buck came in. 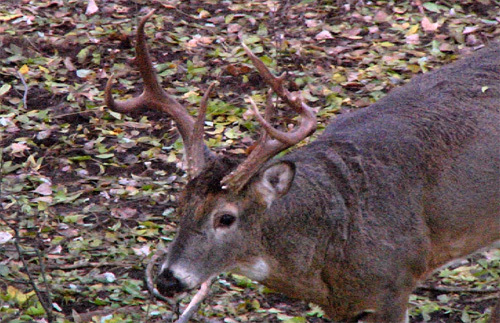 It was a big eight with his left rack snapped off. By the end of the afternoon hunt I had seen 8 bucks, 10 does and one mature buck that made me think for a second or too. Oh, and a dead varmint. Pretty good night!